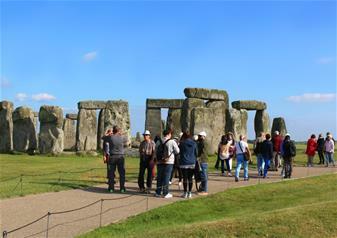 Explore the beauty of wider England and visit two incredible UK attractions – Stonehenge and the city of Bath! A day of ancient history, breathtaking scenery and beautiful architecture, this fully guided tour is the best way to see some of the most impressive parts of England. The city of Bath is stunningly beautiful. A designated UNESCO World Heritage Site - the streets are filled with gorgeous Georgian architecture and in the centre of the city are the famous Roman Baths that gave the city its name, and the stunning Bath Abbey. Take a stroll over the romantic Pulteney Bridge, have a seat on the banks of the idyllic River Avon or explore the wealth of independent shops and bars. During your visit, take a guided walking tour, ensuring that you don’t miss a thing about this picturesque city. Discover hidden secrets and city gems when your expert guide gives you historical facts and excellent recommendations for your surroundings. After Lunch, head to the extraordinary Salisbury Plains, upon which stand the group of towering stones known today as Stonehenge. Stood on the hill for more than 5,000 years, the origins of this mysterious structure may forever remain a mystery. Walk up to and around the stones, learning about the discoveries that were made as well as the different theories and possibilities from your expert guide.